Bishop Pass Trailhead at South Lake. What happens when you set an objective months in advance, plan, prepare, take a long plane flight, then don't quiet achieve what you set out to achieve? 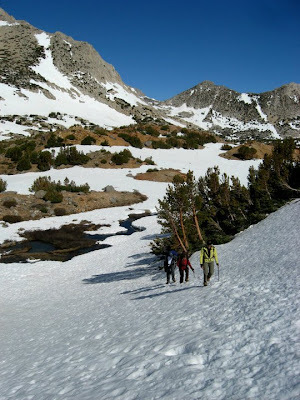 In the case of our attempt on a beautiful 13er in California's Central Sierras, we still had an amazing trip, saw incredible scenery, and made important decisions as a group that kept us safe. It was my first trip to that part of the country, and one I'll definitely remember. Thanks to master planner Justin, we had our itinerary planned out long before arriving in California. Our two day itinerary included a 3-4 mile hike along the Bishop Pass Trail the first day and a night at the highest suitable wilderness campsite we could find. The second day, we'd leave gear at the campsite and carry day packs up to the summit of Mount Agassiz (13,891'). Agassiz has been called the easiest peak to climb in the Palisades region, but it's also the 20th tallest mountain in California. Easy is a relative term. To help with acclimatization, we spent the night before at Parcher's Resort (9,290') in the Inyo National Forest. With Bishop Creek cascading down the hill behind our cabin, I felt so happy and at peace. I also felt the familiar slight dizziness and racing heartbeat that comes with being at altitude after coming from sea level. In the morning, we drove back down to Bishop (4,200') to pick up our wilderness permit at the White Mountain Ranger Station. Permits are required for overnight camping in most of the Inyo National Forest and those for popular areas like the Mount Whitney zone go quickly. Thanks to master planner Justin, we had our permit secured for the Bishop Pass Trail, which has a quota of 36 people each day. Mt. Agassiz in the Sierras from Long Lake. Discussions with forest rangers confirmed what we already knew - we'd have an unusually high amount of snow to contend with. The summer months are best for climbing Agassiz, but the Sierras had more snow than normal this year. 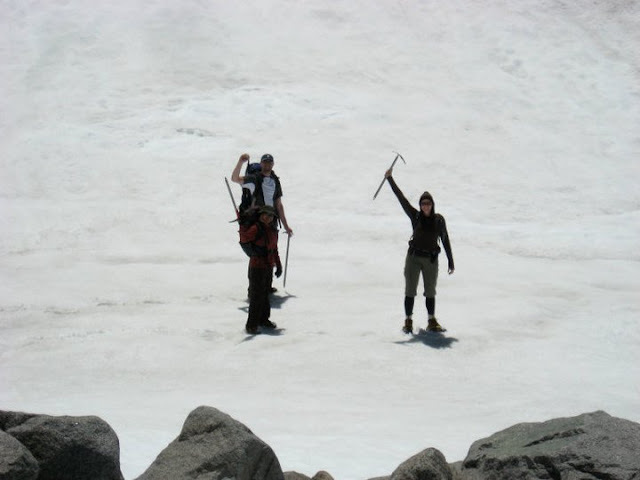 To ensure we were prepared, we brought ice axes and crampons with us, some rented from Wilson's Eastside Sports. 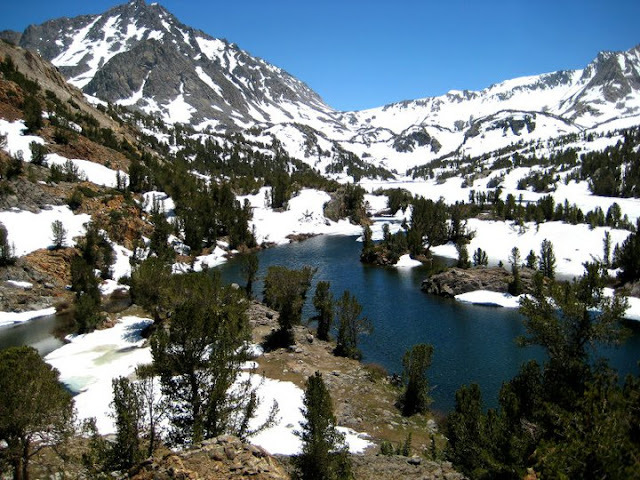 From Bishop, the Bishop Pass Trail is accessible by taking Route 168W out of town and making a left on South Lake Road. The vehicle climbed over 5,000' on the roads for us! The trail begins at an elevation of 9,755' at the end of South Lake Road and provides a number of day hiking options outside of what our itinerary allowed. We set off just after noon on our first day intending to take our time and enjoy the scenery. The first mile of the trail is wide enough for two hikers to walk side by side. The colored blazes I'm used to from the east coast were absent, though it did seem markers were cut into some of the trees we passed. The first junction we came to was the Treasure Lakes Trail and the second came a mile later. We continued on taking frequent breaks to help adjust to the altitude and because we couldn't pick our jaws up off the ground. The Sierras are beyond stunning. We passed beautiful evergreens and aspens with thick, dark colored bark and countless tiny wildflowers growing out of what seemed like nothing. Long Lake still partially frozen, atypical for this time of year. Heading up toward Bishop Pass. Lots of snow! As we sat down for dinner, we discussed our plan for the following day. We'd wake up with the sun and get moving as early as we could. Our turnaround time was set for 1pm, which would give us ample time to return to camp and pack up, then hike back to the car. We had a full day of sport climbing in Clark Creek Canyon planned for the next day and needed time to recover. As soon as sun disappeared behind Hurd Peak (12,237') which we affectionately renamed "Turd Peak" because all adults act like children once in a while, we went right to sleep. I didn't feel the effects of altitude as much as I expected and slept like a baby with my Therm-a-Rest Sleep System. When sunrise rolled around, we packed food, water, a water filter, clothes, plenty of sunscreen, crampons, ice axes and first aid supplies. The temperature was at or below freezing; there were a number of iced puddles on the trail. As we wound our way around Long Lake, snow patches became wider and steeper. We donned crampons an hour into the hike. Keeping track of the trail in the snow became incredibly challenging and we found ourselves making frequent stops to make sure we were still on track. The Inconsolable Range kept the sun off us until mid-morning; we passed the Timberline Tarns and Saddlerock Lake before the sun reached us. 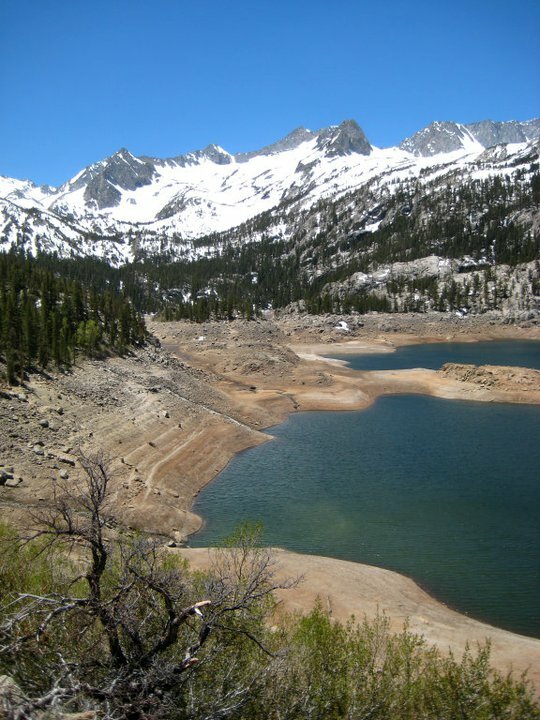 We reached Bishop Lake and followed the Bishop Creek drainage up to Bishop Pass. 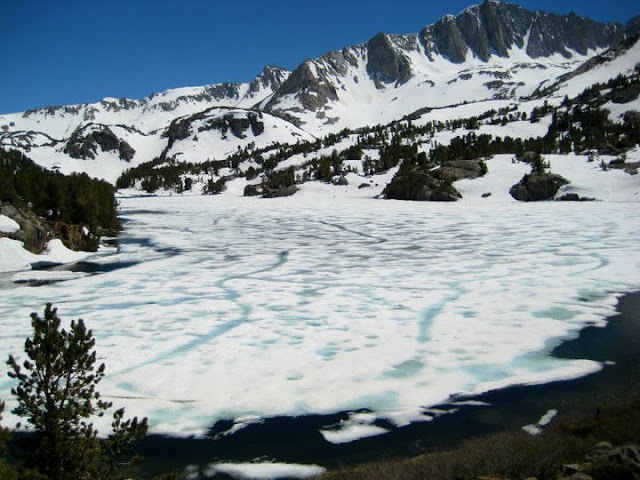 Other trip reports I'd read showed beautifully maintained switchbacked trails winding up to Bishop Pass, almost impossible to miss, but everything was completely snow covered above Bishop Lake. to summit looks like...lots of rocks! We reached the base of Mount Agassiz at 10:30am and spend a good bit of time trying to find the "usual" route to the summit nearly 2,000' above us. We ended up taking one of the right hand chutes, which involved third class scrambling in places with a mixture of large boulders, talus and slabs. 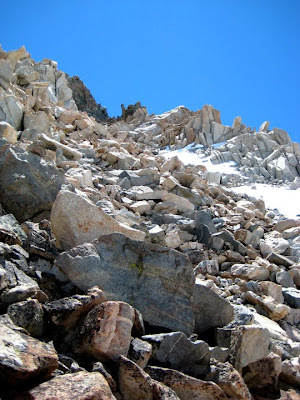 Most of the boulders shifted under our feet and I began to feel effects of the altitude as we climbed. We still had 500-600' to gain as our turnaround time approached, and we made the decision to descend short of the summit. After picking our way down the boulders and talus, we traversed back down the snow slopes and along the Bishop Pass Trail to camp. It's difficult not to feel disappointed when you don't achieve your objective, but in this case, I was proud that our group stuck to the plan and turned around when we needed to. Many accidents and epics I've read about occurred because teams were too summit-hungry and didn't turn around when they knew they should have. In all likelihood, we would've been fine packing up camp and heading out in the dark, but that doesn't mean it would've been a good idea! I started feeling the altitude on the descent and two migraine pills later, I still wasn't myself. By the time we got to the hotel in Bishop, all I could manage was to fall asleep in the room while the rest of the group went out to dinner at Whiskey Creek. Another few hours on the trail would have been incredibly uncomfortable for me. In the end, it was an incredible trip. We finished the five days off with some sport climbing at Clark Canyon and a little bouldering in the Buttermilks. I'll definitely be back at some point, the Sierras have so much to offer! Have you climbed there? Have a story about observing or not observing turnaround times? Tell us in the comments! nice! I've always wanted to go to the Sierras! I usually have two turnaround times, one for when we'd like to be back (ie time to get to the bar before it closes) and one for the latest it would be safe to be out (which might include spending the night or walking in the dark). Of course this doesn't apply for routes where the best way out is up, or if someone is injured or is getting AMS (which sounds like may have been starting to happen in this case??). 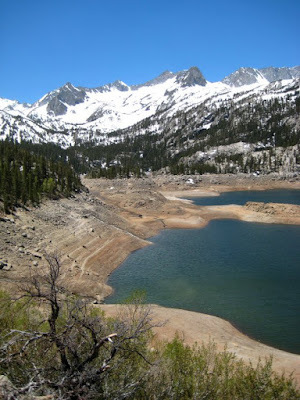 Great trip report :) I'd love to get out to the Sierras to do some climbing sometime. Great job listening to yourselves and turning around, you're right there are too many stories of summit hungry climbers that don't turn around and things don't always end well. Thanks Haley! Agreed, it's so important to make safe decisions and not to succumb to summit fever. We could've continued on, but none of us wanted to hike out in the dark, especially given the wayfinding challenges. The Sierras are beautiful; hope you make it there soon! And yes, we could've camped in the snow with our tents, but the spot we found was too good to pass up!